While Telstra might have delayed the launch of the HTC One XL until sometime in June, MobiCity have beaten them at their own game by offering the device for purchase right now. The HTC One XL comes in black and works on all Australian 3G networks, but most importantly it works on Testra 4G LTE network on 1800MHz. The main difference between the One XL and the One X is the inclusion of Qualcomm’s Snapdragon S4 Dual-Core CPU which can certainly hold its own against the Quad-Core Tegra 3 in the One X as it is built on a smaller 28nm fabrication process — Tegra 3 is built on a 40nm process (smaller is better). If you’re interested in buying one, MobiCity are selling them for $850 a pop. I’ve already purchased mine and will be reviewing it once it arrives. I'm hoping the locked Telstra one will be a tad cheaper. I've just ordered one too. 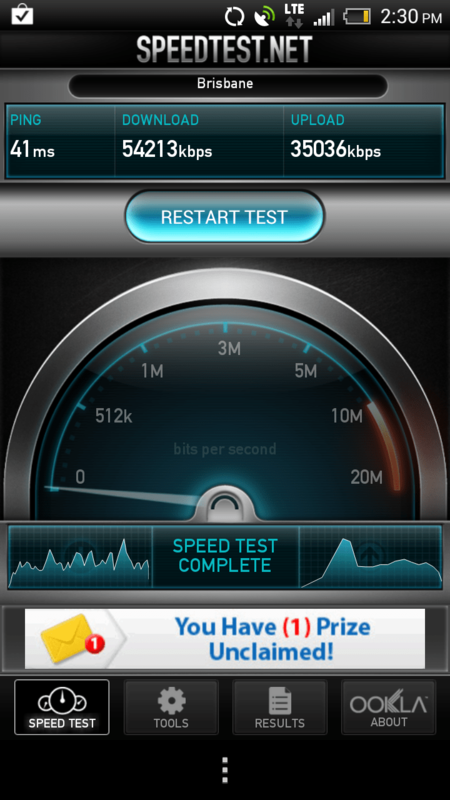 The difference between this and the hoped for sgs3 (lte??? ) is not worth worrying about for me. Been happy with mobicity service in past so I'm buying this on current comparisons and my delight with previous HTC phones. Does it take a regular sized sim or a micro-SIM? This is crazy, there is something different about being able to bring a random unannounced (by the telco) phone onto their LTE network... love it. Its not like with GSM, where there is a number of compatible networks worldwide, .. LTE, with limited worldwide pickup and frequency banding issues. Imagine taking it into the Telstra Shop and asking for support, showing them that its on their LTE network... "but we don't sell that phone"
Hey Buzz, according to that speed test app you have an unclaimed prize! Wow! Not only do you get to play with the cool phones, but you win prizes randomly too. That's so cool. News from an extremely reliable source us that. the Telstra version will be 32 gig. this is stated on HTC Australia web page. this is no mistake. why buy a gray import with inferior specs I ask. Us early adopters will do crazy, insane things. Once again it's a simple case, similar to the Galaxy Note release by Telstra, the Moto Xoom and will be the same with the release of the Galaxy SG111 by Telstra, they struggle getting the Bloatware act together which holds up the release of the units. They should be called MobCity. The regular One X is selling around $550 now so what is the reason for the additional $300? An LTE chip cannot be worth that much, even if it is coated with "first" frosting! that's the price that comes with exclusivity I guess lol, most new high end new phones go around that price and will steadily go down as time goes on, no doubt it'll fall once Telstra releases theirs. Who knows if that's actually close to the price in south korea since my best guess is they are sourcing it from there since there's LTE there with the same frequency as the ones Telstra is using. iPad Customer Support has been a major Role in giving the customer support and giving them the best solutions.